DolciDeleria: Let's go to the Hop! Caitlyn has been looking forward to the next Sock Hop event at her school since before last Halloween. That might be my fault, since I was trying to help her decide on a Halloween costume and suggested a 50's style skirt that she could wear for Halloween and for the Sock Hop. Somehow I ended up making a pioneer girl outfit for Halloween and promising a poodle skirt in time for the Sock Hop. What's wrong with me??? 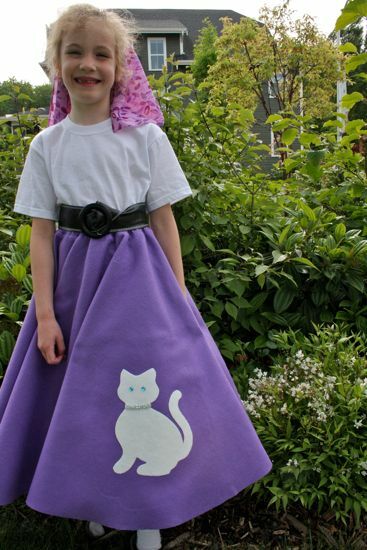 Fortunately, it's an easy skirt. And with felt, there's no finishing: no hem, no fancy seam finishes. I used McCall's 6101, including the cat template, with no alterations. I probably could have redrafted the waist so there's a bit less felt all bunched up, but really, I couldn't be bothered. And this way, there's the hope that the skirt will fit for at least the next 4 or 5 Sock Hops. 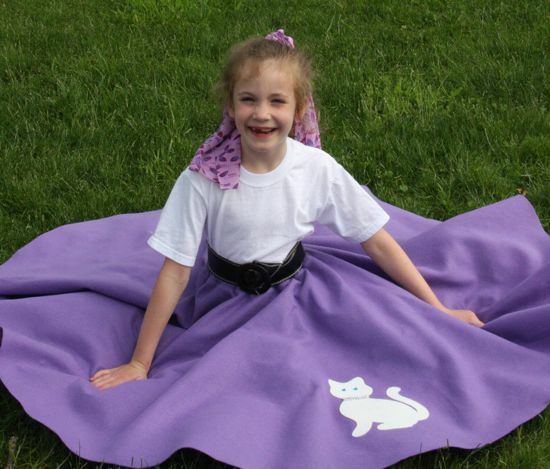 The purple felt is an eco product, made from recycled plastics, which amazingly didn't melt under the iron. The embellishments all came out of the stash. The t-shirt is a project that hasn't happened yet - because I've not gotten around to it, we have a plain white t-shirt to go with the skirt. The belt we found at Goodwill on Monday, a rather amazing find since it's infinitely adjustable. The petticoat underneath is mine from a million years ago and has been part of the dress-up box for years. I made the scarf for Caitlyn's hair on a whim, picking up a remnant of coordinating sheer stuff when I got the felt. 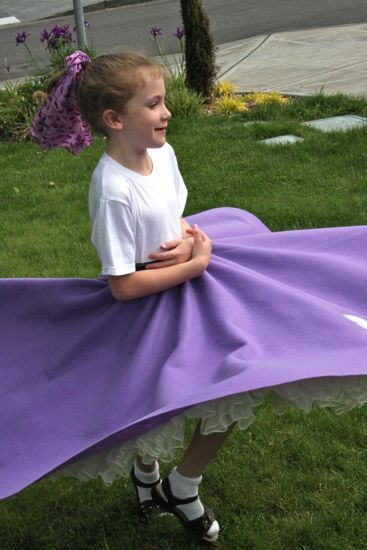 I had a felt circle skirt when I was a kid. It was teal blue and printed with some design (possibly floral?) all around the perimeter. I loved the rhinestones on it something fierce. I loved to spin it out and drop down so that the skirt was spread evenly all around me. Was it just cool? Was I imagining I was the center of a blue flower? Did I like the perimeter the skirt set around me, thinking I was interesting but unapproachable? It's actually probably a good thing that I more or less completely failed to compulsively document my life as a pre-teen. I don't think anyone - including me - really needs to know now what I thought then, about anything. Caitlyn was happy to spin for photos. And she cartwheeled, too! 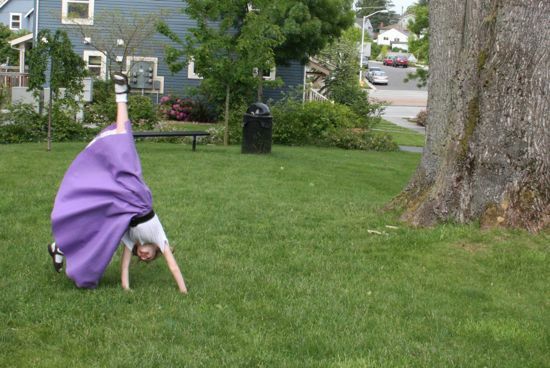 This is the best photo I got, on her first cartwheel, although it wasn't until the third attempt that she figured out how to move with the skirt and land on her feet. Absolutely adorable outfit and that's one amazing cartwheel and several splendid spins. Cheers all around! Love what you did with it - and love the full-circle smiles!